The Mountain Mods ITX-TRG is a high class, high quality, Cast Acrylic, small form factor tower. The ITX-TRG was designed to give Maximum Airflow and Visibility to your Full Size Video Card (GPU), while keeping it as small as possible. 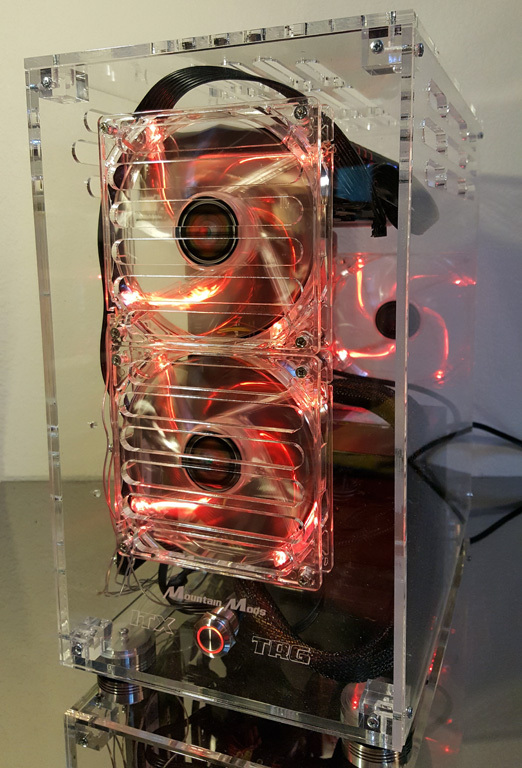 Utilizing a reverse ITX configuration places the GPU front and center at the top of the case. Airflow vents are laser cut on the top and immediate sides of the case. Fresh air is pulled directly into the case top and exhausted out the sides and back of the case. In our lab testing, with 75 degree ambient temps, the MSI card fans do not need to spin at Idle and with hours of benchmarking GPU temps never exceeded 72c. The ITX-TRG measures 13.75 inches tall, 13.5 inches deep, and just 8 inches wide (external dimensions). Given the small size, the ability to install full size PSU and GPU, superior looks and airflow, make the Mountain Mods ITX-TRG a wonderful option for a LAN box or an every day high powered small footprint desktop. The Mountain Mods ITX-TRG includes a high quality Mountain Mods antivandal LED switch, switch connection cable kit, and an all aluminum ITX I/O panel. NOTE - case pictures show MOUNTAIN MODS BILLET MACHINED ALUMINUM CASE FEET installed. Case normally comes with Acrylic feet attached - choose from Acrylic, Rubber, or ALU machined feet. Empty Case Weight: 7.5 lbs.